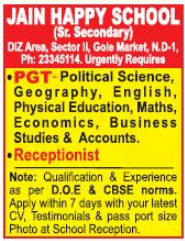 Jain Happy School, New Delhi has advertised in The Hindustan Times newspaper for the recruitment of PGT job vacancies. Interested and eligible job aspirants are requested to apply with in 7 days. Check out further more details below. About School: Late shri sham lal Jain the then President of Jain Sabha, New Delhi (1952) and a well known social figure among the Jains of Delhi. Together with late shri Hans Kumar Jain, Secretary of the Sabha, were mainly instrumental in establishing the school.